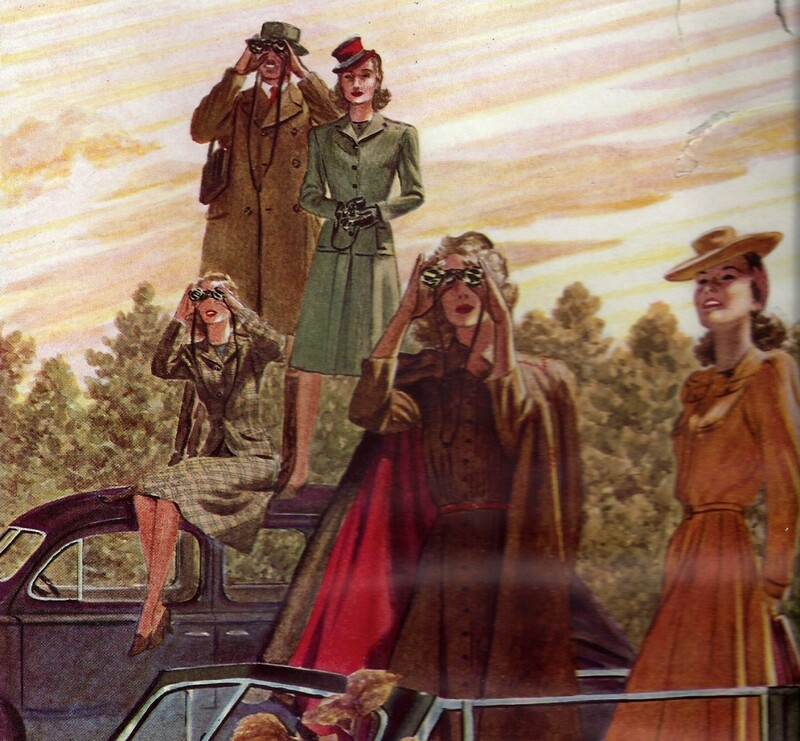 I was recently alerted to this post from Emily’s Vintage Visions, with a super fun contest element: come up with an outfit based on, or inspired by, some particular color suggestions in a 1939 fashion article in the Dallas Morning news. What a fabulous idea! I had a blast hunting for particular colors at the flea market and in my closet, and I came up with three outfits that pretty closely (or very closely) mirrored what was described in the article (which, I might add, is both amusing and clever in its language). 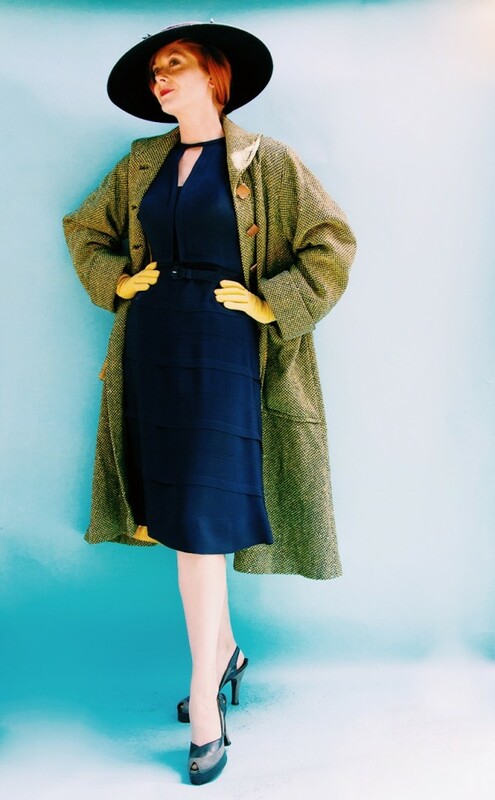 My navy with citron ensemble consisted of a wide brim navy felt hat from Playclothes, a 1940s navy rayon dress with a lovely keyhole neckline and tiered skirt, a navy and citron woven coat with citron satin lining, matching citron gloves, and navy and grey platform heels by Beleganti. This is one of the happy accidents of shooting by myself with a timer in my backyard… sometimes I’m not in place with the timer goes off and I get caught putting my shoes on. I wasn’t really sure what she meant by “a white chalk stripe”, but I thought maybe my Lilli Ann copy was as close as one could get. Suit jacket from Elsewhere Vintage, skirt from Small Earth Vintage. Turns out I had a “navy sailor” and didn’t know it – a sailor hat in the 1930s and 40s was a wide-brimmed hat with a shallow crown, made of straw in the summer and felt in the winter. I took a guess on the “shoulder bouquet” and used some millinery cherries. That was the outfit that I ended up submitting to win the contest (yay! ), because it was so very close to the description. But as far as novel color combinations go, this next one was by far my favorite. “And finally we come to dark-red shoes and bags, preferably in alligator, please, and sometimes referred to as mulberry, claret, wine Burgundy. If you must … the budget rears its head …. you can have your alligator simulated. Or, if an alligator scared your mother, you can still have accessories in one of these deep rich reds in pigskin, suede, or a fabric. (1) A hyacinth blue dress, a fishnet turban in blue and dark red, white or pale pink gloves. (2) A chartreuse dress, dark red coat, soft blue hat, light beige gloves. (3) A two-piece mauve pink dress, lilac gloves, fuchsia hat of veiling. I didn’t have enough pieces to put together 1-3, but I thought I could make something out of #4. Neither my jacket (velvet) or skirt (nylon/acetate) are wool, I still think this turned out pretty close. All flea market and garage sale finds here (except for the fab shoes from Fabgabs). I would never have thought to pair these things together before, and I think that’s one of the wonderful things about Emily’s contest. I’ve since been looking for new ways to combine colors and put together pieces I wouldn’t otherwise have considered. I’m definitely hanging onto this list for future reference. Hmph! No fishnet turban in blue and dark red?! 😉 I love all these looks, and I wish we were still dressing in such adventurous color combinations. I’m so glad you took part in the contest, and congrats again on winning! I should have your prize in the mail later this week. All your outfits are fabulous! I think the “white chalk stripe” in the article was referring to a jacket with a white pin stripe but I’m not certain. 🙂 I think I found the perfect article for a fall contest so stay tuned!